Over the past century and a half, hundreds, perhaps thousands, of men and women have made the commitment to protect the city of Oshawa from human’s greatest adversary – fire. 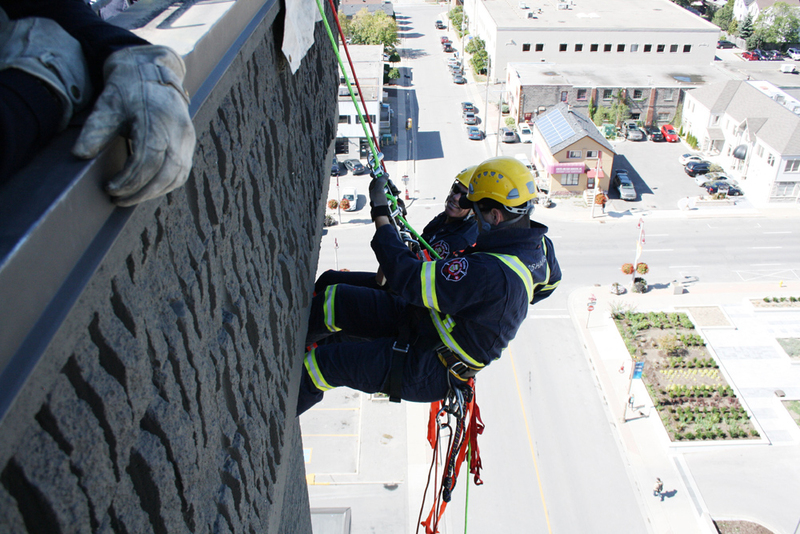 And while there have been various incarnations of what is now known as the Oshawa Fire Service, the purpose of the organization has always been the same – to bring safety to and help protect the residents and infrastructure of the municipality. The history of firefighting in Oshawa began in 1856 with a volunteer department, under the direction of Chief Engineer Patrick Thornton. The city’s first piece of equipment was an old one-handed operated pumper cart. On July 20, 1868, the Oshawa Fire Department was incorporated as the full-time entity, with Thornton serving as the full-time chief. At the time, the city was served by 50 men with the fire company and 15 men with the Oshawa Hook and Ladder Company. The department’s fleet included one engine, some ladders, and numerous line hoses. In 1875, a Ronald Steam Pumper from the U.S. was purchased to replace the department’s original hand pumper. A fire station was added into a new town hall built at the southwest corner of Duke Street (now Richmond) and Simcoe Street North. In 1916, Angus Cameron took over as fire chief and oversaw the obtaining of the department’s first-ever motorized fire apparatus, a Chevrolet Hose Tender. 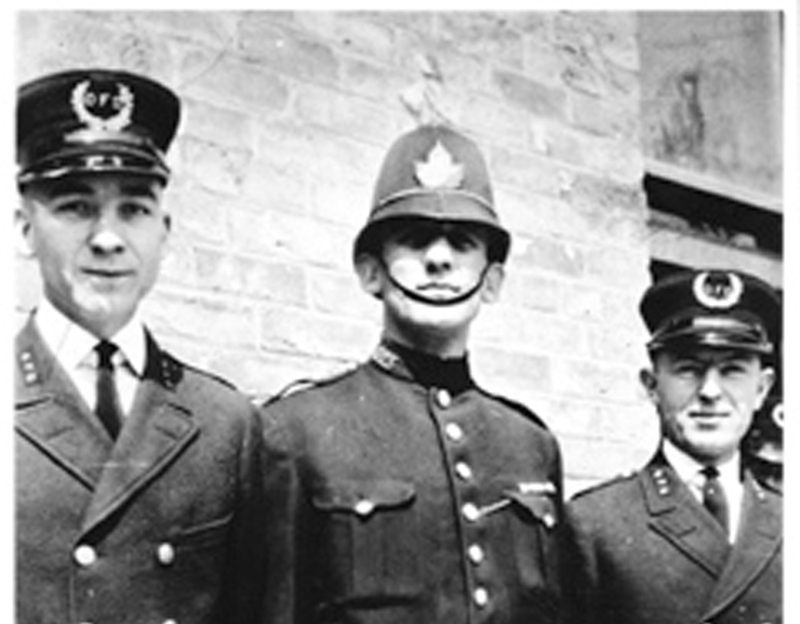 When Oshawa became a city in 1924, Cameron was still serving as chief and named the city’s first four full-time firefighters in 1926. A valuable piece of equipment, a newly equipped GMC Fire Pumper, was presented to the service by GM Canada founder R.S. McLaughlin the same year. A year later, a new beginning came as the fire brigade resigned en masse and the city increased its full-time fleet of firefighters to 16, with Wesley R. Elliott taking over as chief. During Elliot’s tenure, the fire company saw its scope of equipment increase significantly. Added were another pump, a chemical and hose truck, and a new ladder truck equipped with 412 feet of ladders used to reach various heights. 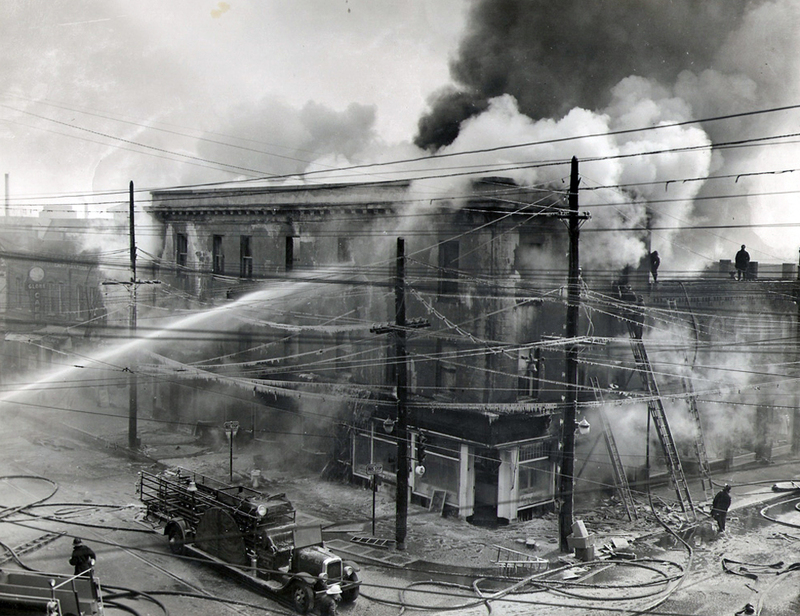 Elliott was also responsible for the development of the city’s first full-scale fire prevention program, which garnered the fire department an award from the Province of Ontario in 1930. Through the decade of the 30s, Elliott oversaw more equipment improvements and replaced rubber helmets with leather ones. Through the 40s, additional new pumpers were added. For almost 80 years, the fire department worked out of its initial station, built in 1877. According to current Fire Chief Derrick Clark, this was commonplace. This began to change in 1946 when a second station was opened in the Cedarvale neighbourhood. The department’s original station was replaced in 1951, opening on Simcoe Street North. Two years later, the Oshawa Ambulance Service began operating out of this building, answering 35,000 calls over the next 20 years. In 1955, Elliott resigned as fire chief after more than 27 years at the helm. He was replaced by H.R Hobbs. The department’s third station was opened in 1955. In the 1960s, a number of notable technology changes were made, including the removal of all street alarm boxes in 1967 and the installation of an alarm board that connected the dispatch centre to local factories, businesses, and medical buildings. The street alarm boxes allowed people to trigger an alarm at a certain location on their street to notify the fire department of an emergency. During the year of Canada’s confederation, a fourth station was opened on King Street East, expanding the number of city firefighters by 24 men. Between 1975 and 1982, the city’s first four stations were moved to their current locations in an attempt to improve response times in a municipality that saw its population double in a 20 year period. “Stations 1, 2, 3 and 4 were part of the revitalization of the 1970s [and 1980s],” Clark says, adding that these buildings are getting close to the end of their lifespan. With the boom in North Oshawa over the past decade, a new 17,000 sq. ft station on Harmony Road was built in 2006. The latest addition was Station 6 on Simcoe Street North in 2016. In 1982, Oshawa became the first department in Canada to implement a computer-assisted dispatch system. Over time, the proper name went from Oshawa Fire Department to Oshawa Fire Service. With all the changes the service has seen over the years, the role of firefighters has changed as well. “The requirements to become a firefighter have changed dramatically. In the past, there wasn’t the community college courses and all the extra courses available,” Clark explains, who became a firefighter about 30 years ago. These days, Clark says recruits come to them fully certified and they decide whether they are a proper fit. As far as work conditions, Clark says it is a mixed bag for current firefighters. Equipment used today, such as CSRV equipment, bunk gear and even the balaclavas worn around the head and necks of firefighters are more safe and cancer-resistant. But according to Clark, when firefighters enter a building they are facing dangers that weren’t present in the past. “Materials that are burning in houses are much more toxic, the gases they give off are much more toxic, so firefighters do face a raised level of seriousness every time they deal with a fire, go to a chemical spill or car fire,” he says. On the other hand, Clark says improvements made to the province’s building and fire codes have created safer conditions for workers. “What we see in modern buildings that have sprinkler systems, it becomes a much better-constructed building that is safe for residents and firefighters,” he says. Fire departments are pushing for more sprinkler systems in buildings, even residential homes. With smoke alarms becoming more prominent, as required by law, the fire prevention aspect of the Oshawa Fire Service has become more pronounced and now consists of programs like the annual Alarm for Life Campaign, fire safety and preparedness presentations in public schools, and fire prevention week, which took place last week. Local firefighters have also made an impact on the local community through the work of the Oshawa Professional Fire Fighters Association, supporting causes such as muscular dystrophy, the Princess Margaret Cancer Centre in Toronto and the United Way of Durham Region, just to name a few. “It’s an endless list. It’s something I’m very proud of because that shows their commitment to the community, which is fantastic. This is where we work, but we also love the community so we want to part of it,” Clark says. Most of the fire service’s formal efforts to highlight the 150th anniversary have wrapped up. They included updates on social media such as Facebook and Twitter regarding the the service’s history, and all trucks were equipped with special decals. A special garden honouring the occasion is located at the corner of King and McMillan Streets. “It’s quite fantastic, they did a wonderful job,” Clark commented. During the annual Doors Open event in late-September, the doors to Fire Station were opened with a number of historic items on display. The Fire Service possesses an impressive amount of historical and present photos that chronicle its history. Clark says many are the work of a retired firefighter named Clay Shaver. In the past few years, Oshawa Fire Service has worked closely with photographer/writer Colin Williamson who is often on the scene at local fires, vehicle collisions and other crime scenes. He has had a number of his photographs published in The Oshawa Express. Clark says he saw this as an opportunity to raise the service’s profile and he has given Williamson closer access than other chiefs may have in the past. While the celebrations of the 150th anniversary are wrapping up, Clark says he wants to continue to embrace history. “One of the things we’re going to work on over the next couple of years is to get some of this history into the halls. So it’s a huge undertaking that something I think would be very important for the fire service,” he says. In the past, there have been discussions of a regional fire service, a plan backed by long-time regional chair, the late Roger Anderson. However, Clark says he meets with his fellow chiefs regularly and it is not something they are looking at. “I know that is always lingering. I think that is for the politicians to decide if that’s where they want to go,” he says. However, he points out there are already mutual aid agreements in place. “If our resources are stretched, we ask for help and vice versa,” he explains. The service and its history is something the city and its residents should very proud of. Emergency services personnel are some of the most underappreciated, yet integral parts of a well-working municipality. While the politicians get the headlines most of the time, fire fighters, police officers and paramedics are out 24 hours, seven days a week, 365 days a year protecting our city and helping to keep us safe. With this in mind, it was a pleasure to delve into the some of the history of the Oshawa Fire Service, celebrating its 150th anniversary this year. Recently the service has received some negative press, and while there are definitely issues at hand, it’s always nice to be able to take a more light-hearted approach. The amount of historical photos that were available to me was verging on overwhelming, which is amazing. It’s interesting to see the equipment that fire fighters wore 100, 50 and even 25 years ago. 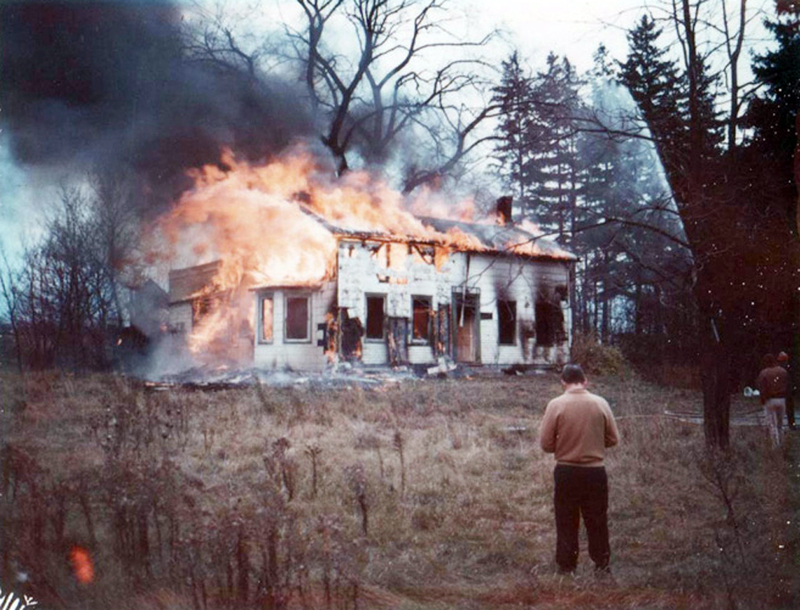 I was personally shocked to hear that up until the 1960s, fire fighters were not wearing a breathing apparatus when entering into a house fire. Current Fire Chief Derrick Clark informed me that they would hold their breath, run into a house, come back out [sometimes vomiting on the sidewalk] and run back in. That sounds unbelievable to me. Between 1975 and 1982, the city replaced two stations and built two new ones in a seven year span, something that really jumped out at me, considering the original downtown station was in place for more than 70 years, and how long it seems to take to complete just one new station in this day and age. It appears the city will have some significant decisions to make in the upcoming years, as Clark notes stations 1 through 4 are nearing the end of their life cycle. In a way, I feel this article really only scratched the surface of the full history of the Oshawa Fire Service, but hopefully it gives some insight on the impact our fire fighters have had for the past century-and-a-half.